antifreeze in the boot just isn’t enough. We have some of the best 4x4 cars, many available on finance. Check out our range today. With rugged wheels, excellent visibility and the advantage of extra traction on uneven surfaces, 4x4s are designed to handle anything the elements can throw at them, keeping you and your passengers safe in even the toughest conditions. Don’t forget to check out our all-wheel drive vehicles too. Four-wheel-drive (4WD) vs all-wheel-drive (AWD): What’s the difference? Often these terms are used interchangeably, but they’re very different in reality. The term 4WD (or 4x4) relates to a vehicle system where the power is delivered to all four wheels simultaneously. This means that the engine splits the power between each axle, so that all the wheels spin at the same rate. All-wheel-drive (AWD) is a more modern concept, where the power sent to each wheel is varied. Lots of SUVs and crossovers now feature AWD, because it is ideal for switching between city driving and off-road. When driving on muddy tracks or through deep snow. For towing a caravan, horsebox or boat. What’s the difference between a crossover, a 4x4 and an SUV? 4x4s tend to have a rigid chassis and high ground clearance which helps with towing and tackling rough terrain. An SUV is lighter which means they often have improved steering and fuel economy. They often have more luxurious features, too. Crossovers are smaller still and can suit those who want the 4x4 look with the practicality of a hatchback. Are 4x4s good in snow? One of the main advantages of driving a 4x4 in winter is the vehicle height. 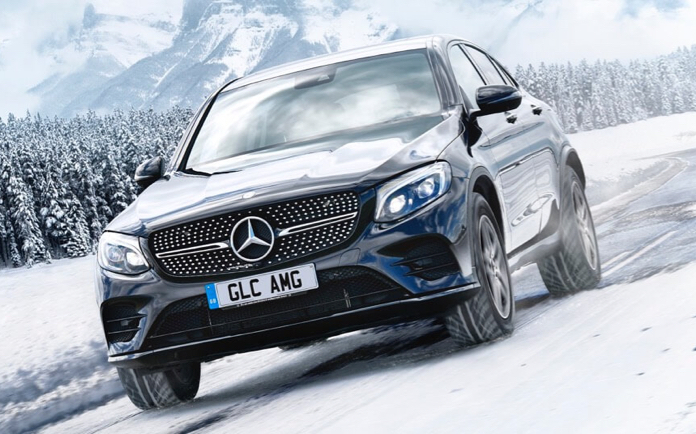 As the chassis sits higher than a conventional car, there’s more ground clearance, which is a big help when you’re trying to manoeuvre through deep snow. AWD is great for driving through a combination of conditions, as it will switch between different power outputs depending on the surface. For drivers living in areas that are more likely to see lots of black ice, driving a 4x4 might not be the best solution, as the weight can increase your chance of slipping. For adverse weather conditions, it’s a good idea to make sure your car is equipped with the correct tyres. During the colder months, winter tyres can improve your car’s performance, efficiency and overall safety. You can also fit your tyres with things like snow chains or snow socks, which you can purchase from your local Arnold Clark Parts department. Are 4x4s expensive to run? Because of its mechanical set-up, a large 4WD vehicle is heavy, and takes a lot of power to move. By opting for all-terrain capability, drivers will usually need to sacrifice a bit of fuel economy. Modern SUVs offer a more affordable option if the majority of your driving will be on ordinary roads and motorways. You’ll still get the raised ride height and commanding view of the road, and a little extra cash in your pocket too. If it’s the rugged style that attracts you most, then you might consider a crossover, which will have all the chunky features of a fully-fledged 4x4 with a much lighter chassis and improved running costs. If you’re looking for a 4x4, you’re spoilt for choice. In order to find the right one for you, think about your lifestyle and what your primary reasons for choosing a 4WD vehicle are. Are space and practicality top of your list? Or do you need a sturdy vehicle that can tackle any terrain?